I’m really excited…feel like a kid on xmas day. 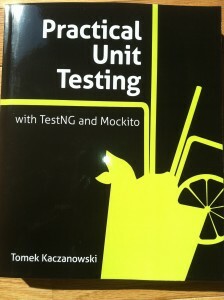 I received a copy of the book, Practical Unit Testing with TestNG and Mockito. The important element is Mockito. I’ve used mock objects in the past but with a fairly basic understanding. This book provides in-depth coverage of mock objects with Mockito. So I’m psyched that I finally have a definitive source of Mockito in my grimy hands. Yippeee! at least one symbol @#$%=:? Before we get into the coding of the Java implementation class, we will write a unit test. The unit test will verify that the generated password follows the security rules. In a previous post, I developed a regular expression to validate a given password. I will simply reuse that regular expression in our unit test. This test sets up the regular expression for password validation. Then we execute the method PasswordUtils.generatePassword(). Once the password is generated, then we verify this is a valid password using the regular expression. Now let’s move on to the implementation code. We can start with a very basic implementation, that will of course fail our test. This is what we’re starting out with. The test fails because we assert the password is not null. That is fine, since we’re following the TDD process of “write a failing test first”. Now, we need to provide the real implementation code. In the implementation, we need to follow the rules listed above. In brief, 8-12 characters, at least one upper, one lower, one digit and one symbol @#$%=:?. So in order to accomplish this, we’ll define the valid characters/digits for each rule. Let’s walk thru the code to see how it works. The code starts with defining a constant for the maximum length of the password. We’ll also define a random generator that we use later. * The random number generator. * I, L and O are good to leave out as are numeric zero and one. If you have been in the IT industry for a while, you will know that certain characters do not make good password characters. Namely, the letters “I”, “L”, and “O”. They are easily confused with their number counterparts “1” and “0” so we’ll leave them out too. Next we’ll cover the method implementation. In this method, we’re building the password string using concatenation. In this case, we have the option of using StringBuffer or StringBuilder. I chose StringBuilder since it is unsynchronized and results in faster code. Now, it is just a matter of choosing a random character from each of the arrays and append it to the string. After we have the first 4 characters/digits taken care of then we fill the remaining characters with random characters from the allArray. At the end of the method, we return a string version of the password. Here is the complete code for the class. Now that the code is complete, we can test it using our unit test. Based on the coding, the unit test passes with flying colors, green bar! I hope that you have found this article useful. Enjoy!